One of the saddest makeup moments is when something you love gets discontinued. Bruise from Urban Decay was one of those shades for me. I even had a gloss (I believe in Gash) to match! This was a product I saved up money for & I absolutely loved it. 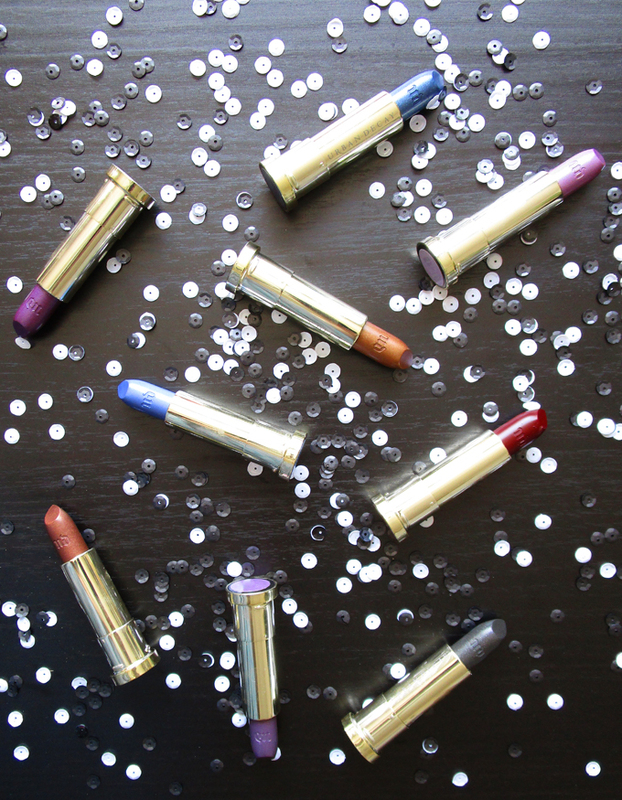 The memory still rings true- & now that I have it back as part of the Urban Decay Vintage Vice Collection of lipsticks brought back from the 90’s vault…I feel that attraction to the shade all over again! 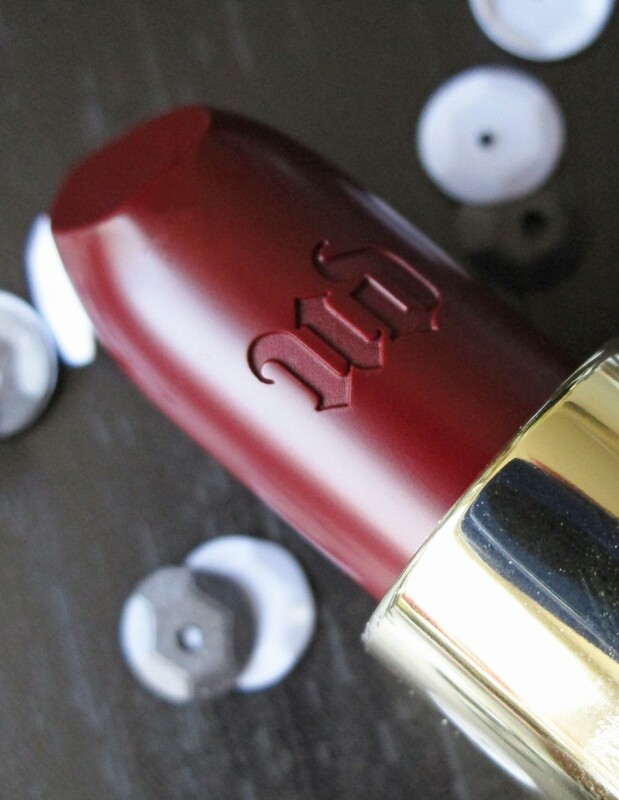 Keep reading to see more about the vintage shades in the gorgeously smooth Urban Decay Vice lipstick formula! From Urban Decay: To celebrate our twentieth anniversary, we’re bringing back nine vintage shades from our original lip lineup. This collection will take you way back to the early days (even the packaging is a throwback!). 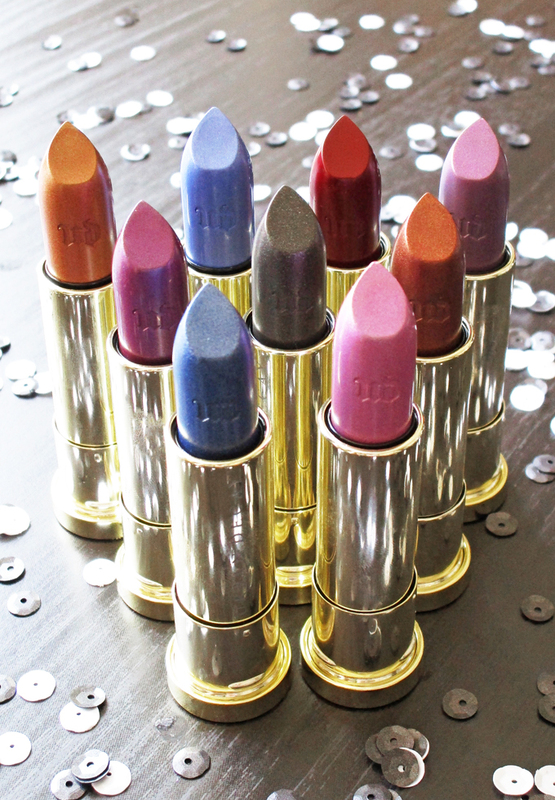 The perfect mix of vintage UD and modern luxury, these shades haven’t been available in years. Even though these shades are 20 years old, they’re still really wearable. Our proprietary Pigment Infusion System™ gives each shade of Vice Lipstick its super-creamy texture, rich payout and superior color dispersion. Yummy Butter Blend comforts, hydrates and enhances, leaving lips soft and conditioned, never dry. Urban Decay Vintage Vice Lipstick in the shade UV-B : a vibrant, cool-toned cornflower blue with purple pearl-y shimmer. The formula is pretty hydrating on this one! It needs a bit of buildup for opacity but is really comfortable. 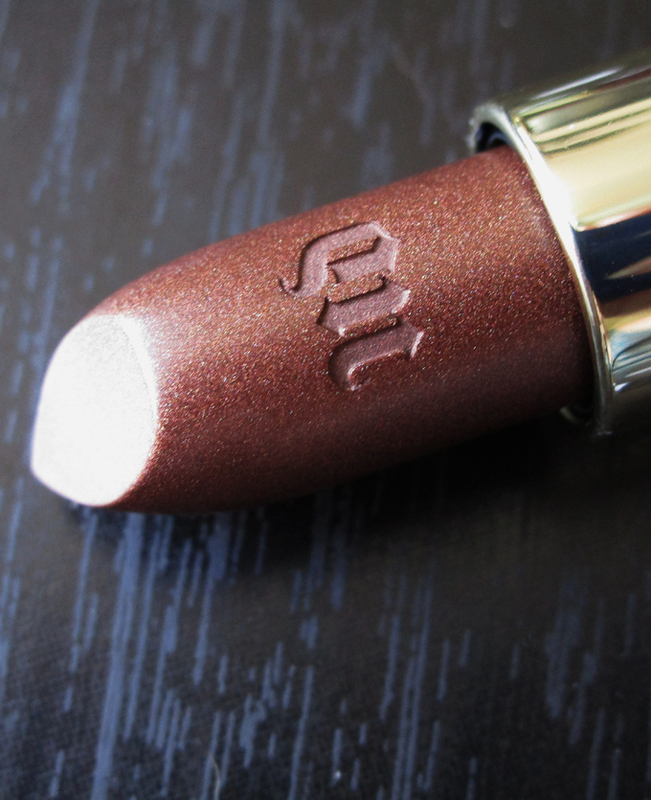 Urban Decay Vintage Vice Lipstick in the shade Smog : a very gold-based bronzed with multi-colored warm shimmer/pearl with a somewhat metallic finish. This shade is creamy but actually really easy to buildup in pigmentation. On my lips it definitely looks more like a metallic. Urban Decay Vintage Vice Lipstick in the shade Asphyxia : a very light pink-based pale lavender with cool-toned blue shimmer & micro-shimmer. This one is definitely more sheer & I couldn’t quite get it opaque without it getting into my lip lines. Regardless I really like this shade! Urban Decay Vintage Vice Lipstick in the shade Roach : a muted red-toned bronze-y brown packed with bronze & multi-colored pearly shimmer. This one can be fully opaque & applies comfortably. 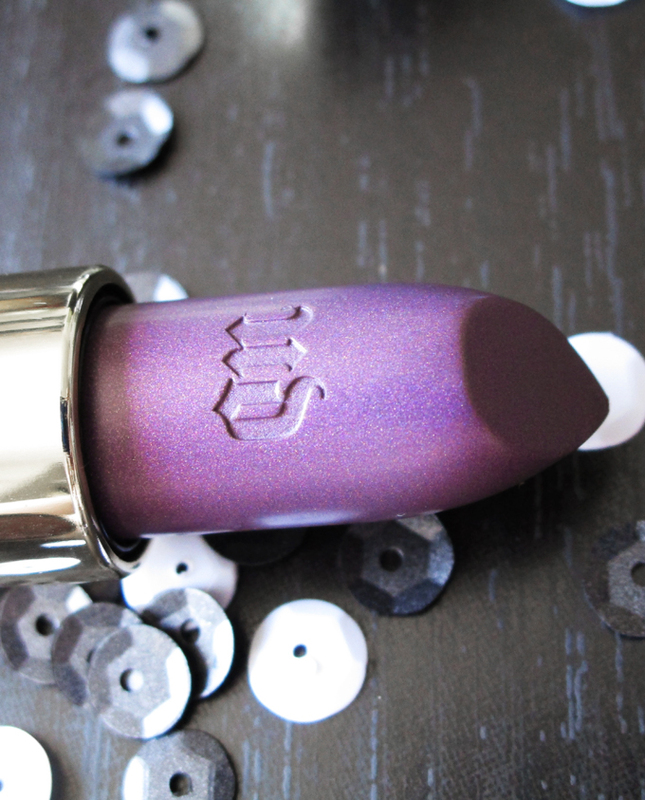 Urban Decay Vintage Vice Lipstick in the shade Pallor : a muted grayed out purple with purple pearl. I really wanted to love this one but you just can’t throw this one on- it definitely needs a lipliner of some kind or it was difficult to build up or even layer. Urban Decay Vintage Vice Lipstick in the shade Bruise : a brightened deep plum-based “bitten” red with very hidden blue/green shimmer. The finish is glossy & it leaves behind a nice stain after it wears away. 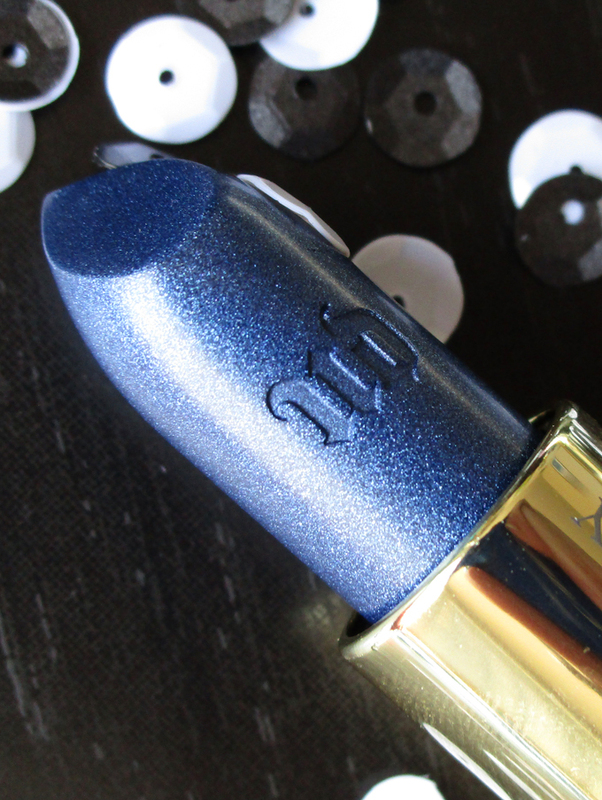 Urban Decay Vintage Vice Lipstick in the shade Frostbite : a cool-toned super metallic blue. This is another shade I really wanted to wear on its own but quickly realized it needs a base! Without something underneath it really looks streaky & slips into lip lines. Urban Decay Vintage Vice Lipstick in the shade Oil Slick : a sheer muted black with silver micro-glitter. 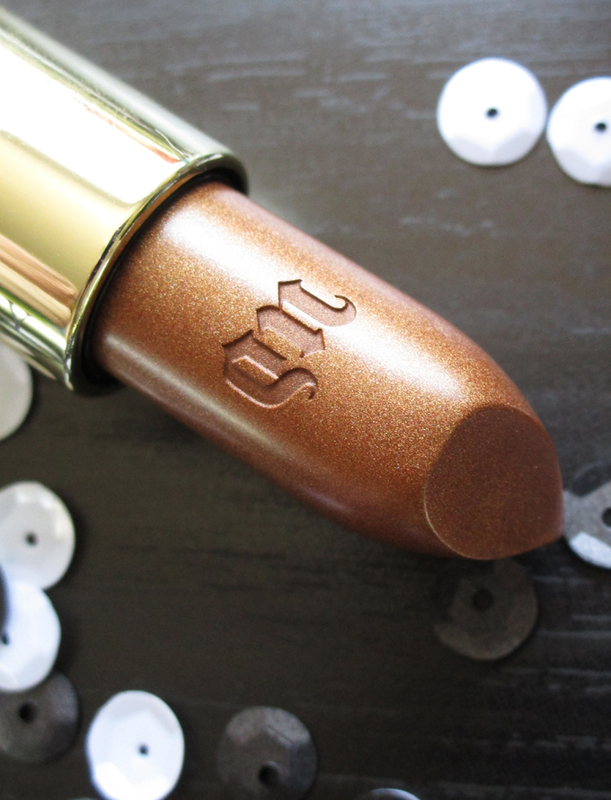 This shade is tricky… & I’m still not sure how to wear it yet! On my lips alone it looks like a super-grayed out medium neutral but I need to keep trying it with different bases. It is really comfortable though! 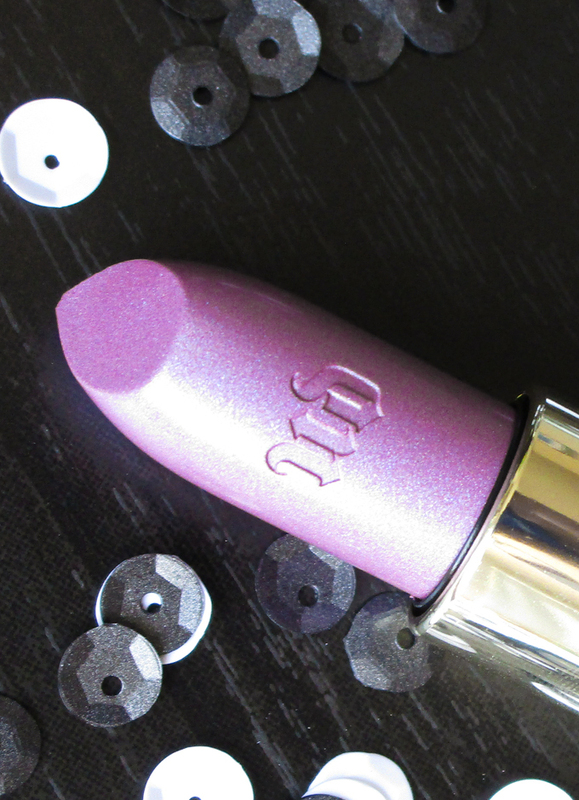 Urban Decay Vintage Vice Lipstick in the shade Plague : a warm purple with blue & fuchsia shimmering pearl. I love the shimmer in this shade combined with the purple- so pretty! The shade is comfortable but definitely performed better with a lipliner underneath. 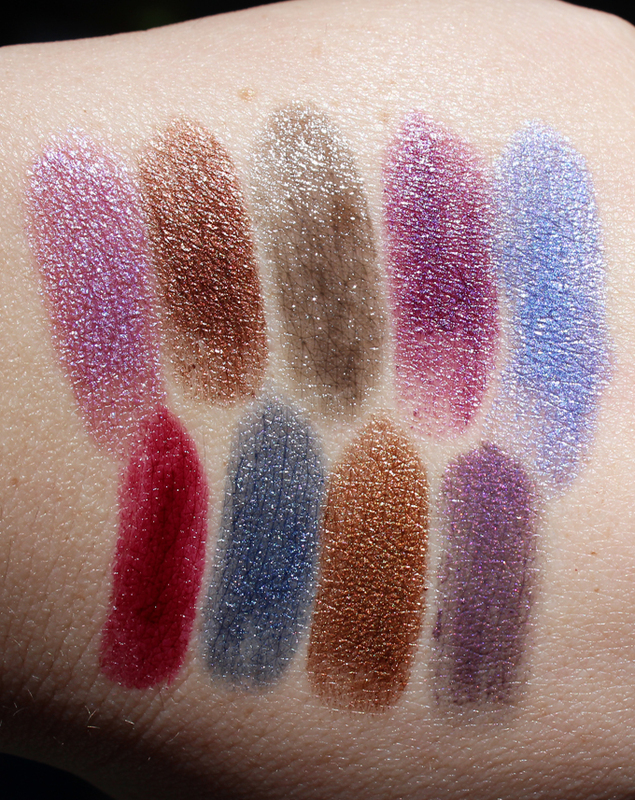 Urban Decay Vice Lipstick Vintage Capsule Collection Swatches left to right top row: Asphyxia, Roach, Oil Slick, Rogue, & UV-B. Urban Decay Vice Lipstick Vintage Capsule Collection Swatches left to right bottom row: Bruise, Frostbite, Smog, & Pallor. All of these shades are currently available & have a retail price of $17 on the Urban Decay website here! According to my press information they’re planning to launch these shades in Sephora, ULTA, Macy’s, & beauty.com but I don’t actually have an official launch date. I’ll try to tweet/instagram etc. when I do! Which shades caught your eye? What lipsticks did you wear in the 90s or that you wear now with the “90s vibes”? Did you own any of these shades? 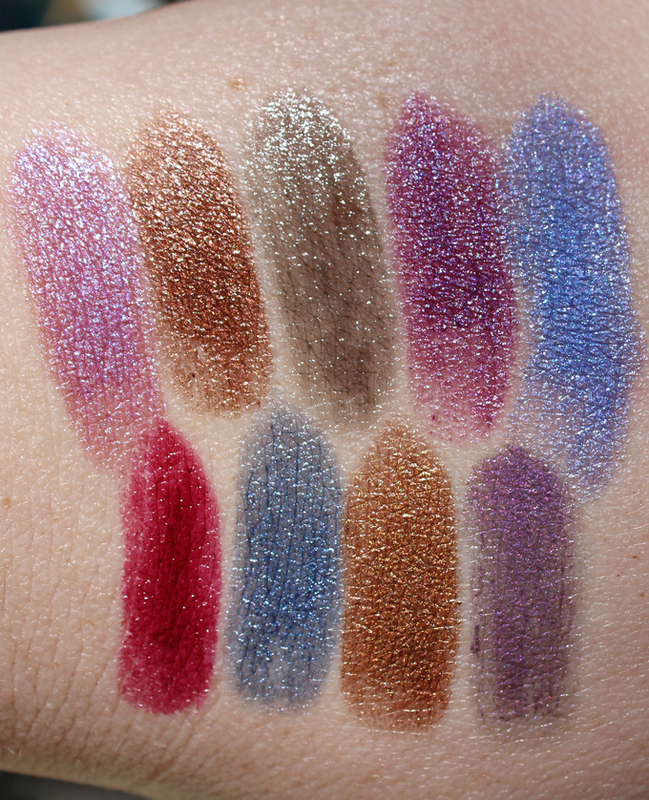 I Finally Bought Some Urban Decay Revolution Lipsticks Urban Decay Vice 3 Palette Swatches & Review Urban Decay Vice 2 Palette Swatches & Review Beauty Brands vs Urban Decay Naked Basics Palettes Review, Swatches, & Eye Look + Video!